The General Electric Fuji Electric 6KG1143020X1B1 is a 20 horsepower drive that belongs to the AF-300 G11 drive family. 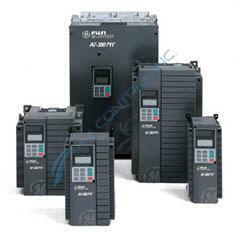 A 3 phase drive, it is able to input 460 Volts with a frequency of 50/60 Hz. The controller outputs between 380-460 Volts with a frequency range of 0.1-400 Hz. The rated output current of 6KG1143020X1B1 is 30 Amps. The unit also includes a front mounted factory installed keyboard panel. A NEMA 1/ UL Type 1 casing encloses the unit, measuring 15.75in (H) x 9.84in (W) x 7.68in (D) and weighing 22.0 pounds. The front plate is removable by loosening the two mounting screws fastening it to the drive. The factory installed keyboard also is removable by loosening the other mounting screws. Proper storage protocol is necessary to avoid drive damage and accidents. Correct insulation will keep both condensation and moisture from penetrating the unit, avoiding corrosion. The facility that 6KG1143020X1 is in should maintain a temperature between -10℃ to 50℃, or 14℉ to 122℉. If the temperature of the facility is expected to exceed 40℃, or 104℉, then the side ventilation covers should be removed to prevent damage. During installation, it is important to pick an area free from debris to mount the device. Free floating debris can pose a fire risk if trapped behind the unit as the heatsink can reach potential temperatures of 90℃, or 194℉. Be sure to follow all safety and installation instructions available in the manual listed on the nameplate.